A high end commercial herd of Red Angus cattle demonstrating much sought after consistent quality. Wagonhound’s well-bred quarter horses have been proven on the ranch, on the trail and in the show pen. An arid climate of cool evenings, warm days at high altitude, and controlled water provide prime weed free alfalfa hay. Hunt Trophy Elk, Whitetail & Mule Deer, Antelope, Lion, waterfowl & fish in some of Wyoming’s finest country. Welcome to Wagonhound Land and Livestock, a working ranch with some of the top American Quarter Horses and Red Angus cattle in the country, and operations spanning more than 250,000 acres. Named for a creek that runs through it, Wagonhound Land and Livestock is headquartered 20 miles south of Douglas, Wyoming, along the Laramie Range of the Rocky Mountains. Wagonhound Creek received its name due to the number of wagons on the nearby Oregon Trail that, while crossing the creek, broke their “hounds,” the part of the wagon that connects the tongue and axle. 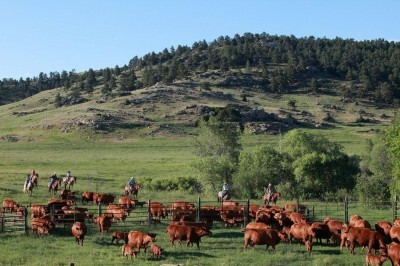 The ranch is mostly private and mostly contiguous in the Laramie Range of east central Wyoming. Wagonhound ranch spreads across three Wyoming counties; Converse, Albany, and Carbon. The ranch’s rugged elevation ranges from 5,000 ft to 9,000 ft and requires talented, strong and steady horses to help the cowboys manage nearly 5,000 head of range cattle and 7,500 head of feedlot cattle throughout year. Management recognizes that Wagonhound needs to be as diverse as it’s terrain in order to be an economically viable operation, one that with proper care will last the family for generations. Diversity includes a unique blend of the historic past with state-of-the-art ranch programs and facilities second to none, including a spacious indoor arena for winter training of elite AQHA champion bloodlines, holistic management of purebred Red Angus cattle from cow/calf to feedyards, low stress cattle handling technologies and advanced herd health practices, and an expansive farming operation to build customized feeding programs for each faction. Wagonhound Land & Livestock is made up of four divisions (Horses, Cattle, Farm and Outfitting) which tightly interact, creating a self-sufficient unit based on historical Wyoming ranch traditions while incorporating new vision in education, technologies, and management of the ranch wildlife and habitat. The ranch vision statement, “Steadfast in Maintaining the Highest Standards”, reflects commitment to remain steeped in history, yet aggressive in leadership. Wagonhounds own off to good start at the Wyoming Junior High and High School Rodeos in Laramie WY last week! Whoop whoop! Quite the cowboys and Cowgirls they are. They may be mounted well, however they are All VERY talented in the sport of rodeo! Way to go!